LOOKING TO IMPROVE YOUR SQUASH PERFORMANCE? HAS YOUR PERFORMANCE PLATEAUED? MAKE A BREAKTHROUGH…WITH OUR ONLINE SQUASH FITNESS COACHING PROGRAM. GET ACCESS TO THE PERFORMANCE PROGRAMS WE USE WITH THE WORLDS TOP PROS! WITH OUR SQUASH FITNESS COACHING PROGRAM WE CREATE A CUSTOMIZED SQUASH FITNESS COACHING PROGRAM FOR YOU USING THE SAME TECHNIQUES WE USE WITH THE PROS. THE PROGRAM IS PROGRESSIVE AND IS TAILORED TO MAKING SURE YOU’RE SLOWLY CREATING THE PERFORMANCE METRICS TO TAKE YOUR SQUASH FITNESS TO THE NEXT LEVEL. OUR PROGRAMS ARE 100% MOBILE AND WORK ON ANY PHONE OR TABLET! Hear what the pros have to say! 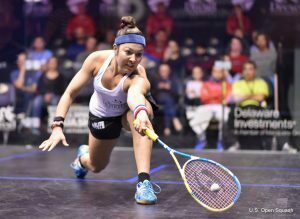 Phase I is the foundational program for any level squash player looking to improve their movement performance on the squash court. This program gives you monthly online access to the first phase of our performance program, you will have access to the program on any mobile device. Once you sign up for the program you will also be able to download the app in either the apple store or play store. Any age squash player can do these movements to improve their performance. Phase II of the Complete Squash Fitness Program takes the foundational elements of Phase I to the next level. This program applies what you’ve learned in the previous segment and ramps up the production and the output of he plyometric exercises. This program gives you online access to the second phase of our performance program, you will have access to the program on any mobile device. Once you sign up for the program you will also be able to download the app in either the apple store or play store. This phase emphasizes proper movement with dynamic movements. You will get to the ball much faster using these techniques. Phase III program uses advanced programming techniques to improve the overall explosiveness, reaction time and continues the movement work from the previous two phases. While working on the third phase you will see greater match endurance and performance. 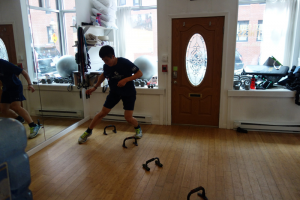 In this phase since you will be moving exponentially better than before you started phase I, we now add resistance training exercises while we continue to implement more advanced plyometric movements specific to squash. This program gives you online access to the first phase of our performance program, you will have access to the program on any mobile device. Once you sign up for the program you will also be able to download the app in either the apple store or play store. This phase emphasizes density training while performing movements that relate directly to playing squash. Try the program free for 7 Day Trial by clicking here!